A popular household pet that originated in Central Australia, a bearded dragon is a type of lizard that typically lives in desert lands, shrublands, and woodlands. All bearded dragons are born with prominent female characteristics, making it difficult to set a female and a male bearded dragon apart. However, differences between the two genders become more distinct as the lizard fully matures. This article provides information on the differences between the two. A male bearded dragon possesses distinct traits and characteristics that only appear over time. Since newborn bearded dragons display prominent female features, a bearded dragon’s gender can only be determined once the lizard fully matures. Physically, a male bearded dragon has a bigger and a wider tail, which has two notable bumps on each side. Males frequently reveal their beard for two main reasons: 1) as a form of courtship and 2) as a defense mechanism. Since male bearded dragons are territorial in nature, they bob their heads, puff their throats and display their beard to show superiority or aggression towards a perceived threat. A female bearded dragon, on the other hand, has a smaller and a slimmer tail which has a noticeable bump at the central portion. 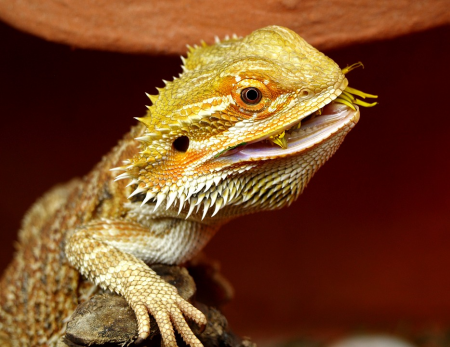 As the name implies, bearded dragons, including females, are distinct for their beard or spikes. Female bearded dragons show off their beard when they are either mating or warding off potential predators. They are less aggressive than their male counterparts, and they typically wave their hands as a sign of submission once a superior female is within their vicinity. So what’s the difference between a male and a female bearded dragon? There are distinct differences between a male and a female bearded dragon’s tail. 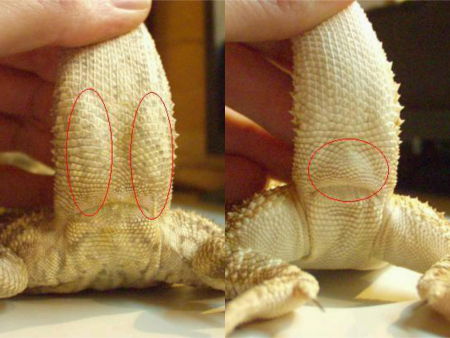 The tail of male bearded dragons has two bumps on the underside, while a female bearded dragon’s tail only has one bump at the middle portion. A female’s tail is small and slender while a male’s tail is bigger and wider. Both sexes use their beards for either mating or displaying aggression. However, males frequently reveal their beard as a form of courtship, while females use their beard to ward off potential predators. Also, male bearded dragons are territorial in nature. Once they are threatened by an invader, they puff their throats, bob their heads and open their mouths to appear more intimidating. Female bearded lizards, by contrast, are less aggressive. They frequently wave their arms as a sign of submission. Male and female bearded dragons are skilled at digging holes, but they use these holes for different purposes. While male bearded dragons dig holes to hibernate, females mainly dig holes to lay their eggs.